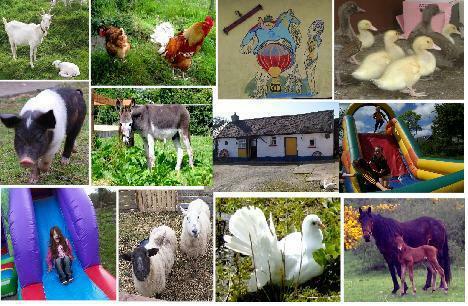 Fairy Fort Farm is a traditional farm in the heart of the Tipperary countryside. It is an ideal location to unwind and relax. Savour the scenery, enjoy lazy days on the farm, feed the animals (hens, geese, goats, horses, ponies etc.). 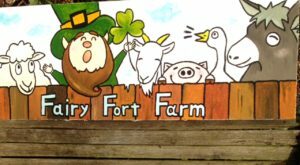 If you want to venture a little further, Fairy Fort Farm is centrally located making it an ideal base to explore the Hidden Heartlands of Ireland, explore the Munster Vales, experience the Ancient East and even take a trip to the Wild Atlantic Way. Click here to see the accommodation you can avail of for a perfect getaway. When the the sky is dark and cloudy, the Little People come out to play. They are searching for gaiety and excitement. No better way to get them jigging and dancing round than to play them a few tunes, or sing them a few songs. They love it, they can’t resist ! They jump and cartwheel around the fort. Most of all they run in and out along the thin trees that cross over the moat, from one side to the other. Sometimes they join in with their tiny little fiddles. They can even play it while standing on their head. The enchanting strains leave you spell bound ! This is a night to remember and visitors talk about it as the highlight of their holidays. The stone door is facing the West and though they can go straight through it, some of the surrounding stones are disturbed ! This is caused by the galloping of their little horses, as they come and go throughout the year ! A night with the Fairies and their enchanting magic is surely not to be missed !